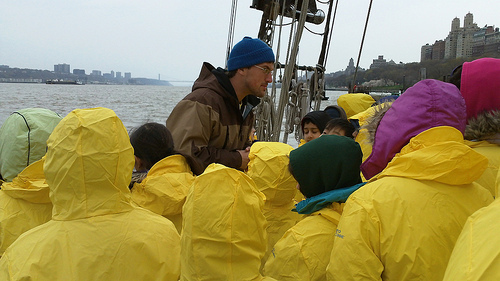 Two Onboard Education Coordinators live aboard Clearwater, on alternating weeks, and lead two three-hour education programs daily in the spring/fall with some multi-day programs in the summer. While aboard, Onboard Education Coordinators train crew and volunteers to teach learning stations to groups who sail with is, operate/maintain a trawl net, and other education equipment. While in the office, Onboard Education Coordinators coordinate program content between schools, volunteers and staff. A degree in education, natural sciences, environment studies, or related fields and several years of classroom or outdoor teaching experience are desired. Applicants must be motivated, in good physical condition, enjoy public speaking, have experience with environmental topics and love to teach. Sailing/musical experience a plus. This is an 8-month, full-time position, room and board provided while aboard boat and accommodations in crew quarters available while working at the office in Beacon, NY. Education Coordinators are required to pass a pre-employment drug test and background check. Clearwater is currently accepting applications for the spring 2018 sailing season. Please submit your completed application, a resume, and cover letter to: educator@clearwater.org with the subject line: “Onboard Educator – CW”.